The plot, as presented by the film company is A top-secret bacteriological weapon developed by the U.S.Government to create an army of super soldiers triggers an epidemic that turns the citizens of a quiet town into mutated zombies. In an effort to conceal the outbreak, a team of mercenaries is assembled to infiltrate the infected city and detonate an atomic bomb destroying the monsters and all the evidence along with them. No one has to know the truth…unless the mission fails. Of course the cast is a clichéd rag tag mix of characters, each with a specialty and a leader with a questionable past. After an opening showing the zombie outbreak in the small town, we move to offices of high ranking government officials, but they appear to be in a small cottage somewhere and speak with european accents. When the President of the United States calls, it’s Uwe Boll making a cameo, in a curse laden tirade that presents a man of his lofty position as anything but. When our team of mercenaries head out into the village, which is made up of a few deserted locations (including some kind of plant), the low budget continues to show. The lack of script, action, and quality dialogue are wrapped in a YouTube caliber presentation of awkward angles and closeups. Since there is a zombie outbreak, there is the inevitable zombie horde attack – which has less zombies in it than a pickup basketball game – and somehow our heroes start to run out of ammo anyway. The movie’s one saving grace is its makeup work on the zombies. From the initial zombie attack to the final zombie boss monster, the makeup work looks great. Unfortunately, the big bad would look better if it wasn’t in bright sunlight, but it’s just another in a long string of questionable directorial choices. 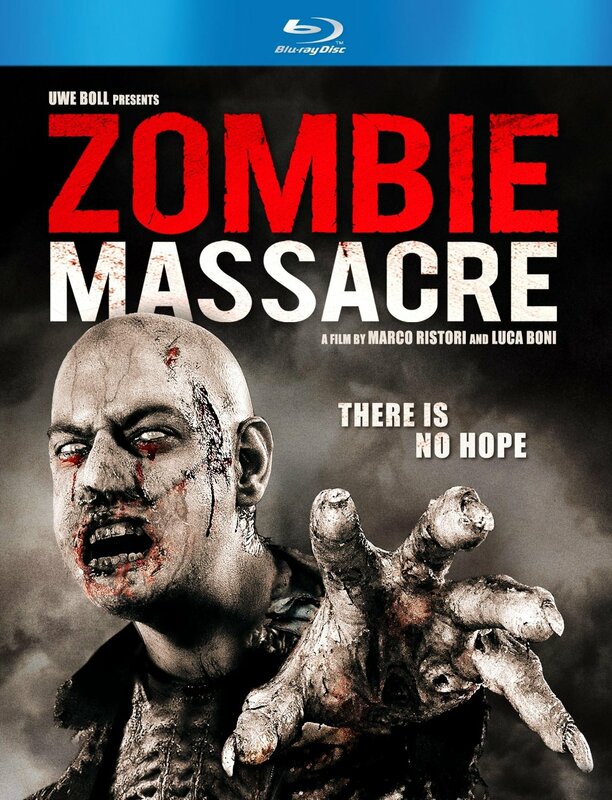 Zombie Massacre is not a good movie. I don’t expect anyone to seek out this movie, but I figure I will see it while flipping channels late at night. The movie might be watchable with quantities of alcohol and friends to make fun of it with, but I don’t ever see myself sitting through it a second time.